I received an ad earlier this week from the outstanding take-and-bake chain, Papa Murphy's, announcing their new pizza for grilling. I was of course interested, so I called and asked a little about it. It turns out that it's their usual pizza but it comes with an aluminum pan. The word "with" is key here, as the pizza does not come in said aluminum pan, which came as a shock. It comes on their usual oven-safe cardboard pan. When I saw the separate aluminum pan I immediately thought, "What am I supposed to do with this?!" My wife explained that I was supposed to grill the pizza on the cardboard pan for the first five minutes and then transfer it to the metal pan. What? Why don't they just make the pizza in the metal pan?! This was quite a mystery to me. The grilling instructions call for the same temperature as for oven cooking; at least for a charcoal grill. I was planning to cook it on my Ugly Drum Smoker (UDS), so I thought, "Wait a minute. Why can't I just cook it completely on the cardboard pan like I would in the oven?" Heat is heat, and the pizza would be further away from the coals in the UDS than it is from the heating element in the oven. So that's exactly what I did. 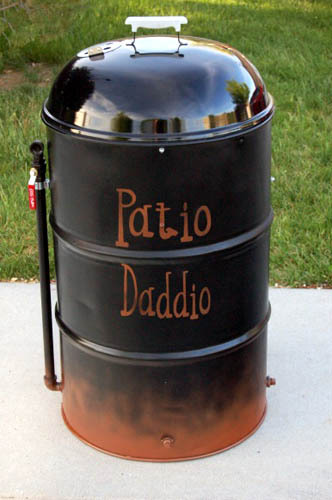 I fired up the UDS and let it get to about 425º. I put the pizza on the top rack and cooked it for about 30 minutes. The average temperature was probably around 415º, so it required a little more time to brown up than in the oven. As you can see in the picture (click it for a better view), it cooked wonderfully on the standard pan. The crust was perfect and there was no sign of burning. So, the next time you are in the mood for grilled pizza and you want avoid the hassle of homemade, grill up a Papa Murphy's. 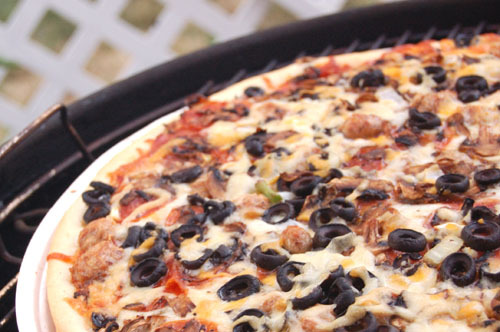 Note The aluminum pan is almost certainly required for smaller grills where the pizza sits much closer to the fire. Please follow the directions in those cases.